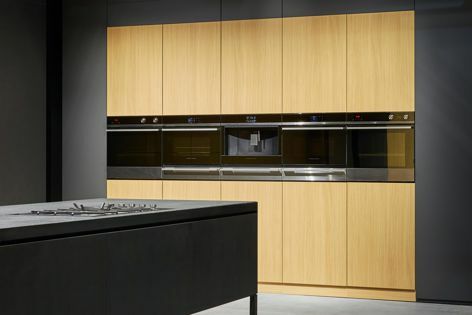 Fisher and Paykel’s Companion Product range has a strong emphasis on integration and detailing, with black reflective glass and polished metal trim contributing to a seamless aesthetic and alignment. Fisher and Paykel’s Companion Product range is a modular suite of smart, contemporary appliances designed for the modern kitchen, where people and food come together. The kitchen has always been a place to prepare and cook food, but the modern-day kitchen has also become a place to entertain, socialize, work, study and play with the kids. This new multipurpose hub needs adaptable appliances that offer high performance, functionality and exceptional design. The Companion Product range includes pyrolytic, steam and microwave ovens, a warming drawer and a coffee machine. Designed to match, the products have a strong emphasis on integration and detailing, with black reflective glass and polished metal trim contributing to a seamless aesthetic and alignment. Each product is based on standard 60 cm dimensions and can be installed in linear, stacked and paired configurations to create one cohesive unit.